One feature of the Windows 7 user experience that wasn’t demoed or even talked about last week at PDC 2008 is called “Aero Shake” – the same feature that led Rafael on an epic journey to unravel the secrets of build 6801 superbar. What Aero Shake does is allows you to shake your application windows furiously, to quickly minimize all other windows, at the same time experiencing a seizure in your hand. It’s a pretty cool feature that I can see some practical use for it, but I think they need to work on the sensitivity so users don’t wear out their desk. Oh my god , now this is so damn awesome , never expected aero shake to be something like this , incredible stuff ! It would be great, if only all programs on the current screen would be minimized by shaking? NICE! Mouse gestures finally make their way into Windows. About time. Can’t believe all this! Who is responsible for all these nice ideas? Is it Julie Larson-Green or Jensen Harris or? I hope they also have a hotkey (like Windows+L or Windows+M) so that I don’t have to reach for my mouse. They do have. Windows key + Home button. They can have Richard Simmons star in the introductory video. Could you imagine? Is this still Windows? I really want to know who deserves the credit for all of the cool stuff like this. Taken by itself it’s kind of cool, but not necessarily awe-inspiring. But this, plus the new taskbar, and the window moving and resizing, the ribbon, etc. is leading to a genuinely slick, and more usable, and cool OS. It looks like Microsoft’s taking Apple’s cool and easy-to-use image at heart and is finally fighting back. And let’s face it, that’s always what they’ve been good at. They make something, they get leap-frogged by their competition, and then they fight tooth and nail until they surpass it again. Heck, IE8’s almost usable again! Seriously, though. it looks like soon I won’t have to defend my preference for Windows as much. Very exciting. amazing feature, is that part of touch technologies or ordinary mouse gesture? (isnt that same thing? ); now im sure that 7 will be best windows since 98; theres topic on neowin, screenshot contest of non existing windows roma and one guy present interesting idea merging classic taskbar with ribbon (classic means what we have now) and that reminds me windows longhorn prototype from 2003… maybe ms wants to restore forgotten and leaved ideas? Another neat mouse gesture! It would also be neat if you could just hover your cursor over the Taskbar somewhere, and use your mouse wheel to flip through windows through Flip 3D or Alt-Tab. You can flip through the windows now with your mouse wheel. I think by default there is a Flip3D button in the quicklaunch area so you don’t have to use the key combination. I dunno what they’ll do in Windows 7. Wow, talk about GUI outside the box! 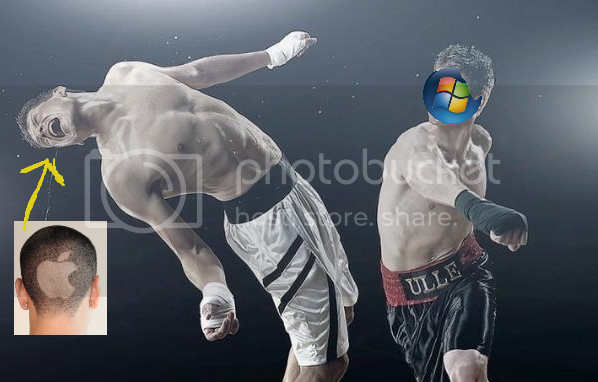 I could just see how the ads for Win7 will be run: Shake, shake, shake! Wow, great idea. i can’t imagine 🙂 Microsoft & Windows Rockz. I’m PC! Pingback: Windows Se7en - Toute l’actualité de Windows 7 - News, Tests, Exclusivités, … » Blog Archive » Secouez Aero! Oh please… you call this awesome? I was searching for something awesome in that. Give me a break. I dont wanna to use mouse and shake windows any time I want to minimize other windows. Maybe any keyboard shortcut would be better? Hey Long, I see tabs of windows being shown in the taskbar, is this because it is a hacked version of the new taskbar, coz the video shown at PDC showed only icons when IE or the Motorola window was opened. I hope you understood what I’m asking. @Manan: I don’t understand exactly what you’re saying, but it is a hacked version of the 6801 taskbar. Ah, looks like somebody posted this on slashdot or something and the 15 year olds came crawling out of the woodwork. It shows a Vista taskbar, screen shot from Julie Larson’s Win 7 demo (Keynote) and a screenie taken from the video you posted in this article. As you see, the Keynote screenie does not show window title but the other 2 do. I wanted to confirm, is this a new behavior of the superbar and is it a toggle on-off feature? I think Paul mentioned superbar’s emulation of the OS X dock, is this what he was referring to? @Manan: labels for the icons in the taskbar are still available. on the PDC video the settings for labels is OFF. Hmm… looking at the new taskbar with text labels enabled, I don’t like how there’s a lot of space in between the taskbands, although it show which icons/programs are running (icons = closed program/icons with labels = running programs). Oh, I see. The space between the taskbands is/was how Jump List was going to be implemented. That is nice. A good feature that will more than likely have an option for sensitivity. That looks like a speedy system, too. Even with those small applications, they open quickly. I wanted to know what will the hardware requirement for windows 7 be? I hear that it will run perfectly fine on a pc with existing Windows Vista configuration/requirement. However, I was interested in knowing the configuration requriement relating to the multi touch. I hope they ditch the spaces between the buttons in the new taskbar and implement the drop down button inside the button itself. Right now it’s wasting space. The newer builds (like the one shown at PDC) are more refined. It doesn’t have a separate button for the jumplists. And by removing the button they’ve removed some of the space. I think this shake gesture would be very useful while dragging and dropping to put something to the desktop! Pingback: What are the new and notable features of Windows 7 ? - Unofficial Windows 7 Blog! On a related rumored feature, anyone have any info on whether a virtual desktops function will make it into 7? I’ve read that that’s what “Workspaces Center” will control, but no solid confirmation. Hasn’t that been in every version of Windows since at least Windows 95? It’s already in XP and Vista, anyway. ja ouviram falar do compiz fusion? Windows + D Minimizes all windows, Aero shake leaves open the window you are working with. This is much different, and in my opinion, much more useful! @Ricardo Dawkins So in other words, if I turn of the labels the windows minimized will hide behind the icon on the superbar and if it’s not, it works pretty much the way the traditional taskbar works. How did you get text lables on the new superbar? Anybody heard of Mac OS X. Been able to do it for the last couple of YEARS. little thing called expose. Hope these features will be awesome when using with Multitouch PCs. Initially I thought it looks nice, but now I realise it’s next to useless. Flashy GUI effects are not what makes an OS any good. I want to see meaningful changes in W7. Reduce the kernel footprint, upgrade the file system to the 21st century and, please, let’s have at least some attempt to integrate W7 with other OSes. It’s called interoperability and, no, that doesn’t mean having everything else interoperate with Windows. Finally, stop playing catch-up with everyone else and actually surprise me Redmond! Ive had this feature for soon two years on my linux-desktop, totally useless but quite fun imo. But for the guy who wondered who to thank for this idea you can check the plugin author somewhere at compiz-fusion.org. In Aero, open programs need to repaint themselves unless they are minimized. Even the parts of them that are covered by other windows. This was not like this before Aero, and it is obviously a weak point of it. Eh kinda cool. I’m hoping for multiple desktops. Wondering, if it’s usable in a maximized apps since it’s kinda rare for us to have unmaximized view. Cool,But I like windows ultimate RTM 7600 + lenovo oem key !